I’ve been away for a while, but it has had a lot to do with study and work and volunteering and all that stuff. It you were wondering, it’s all going fine 🙂 but trying to find the time, and dare I say it, the enthusiasm to blog as regularly as I used to, had been hard. And today I cheat! Today, I am just going to paste, holus-bolus, my last assignment here (for my SUS101 subject—I am studying Sustainability at USC) —it’s on food waste and had to be written as a magazine article. I agonised over this as there is SOOOOO much to say about food and how we waste it—I hope I have nailed it, and it is easy-to-read, informative and entertaining. As an assignment for Uni it has all the requisite citations of materials embedded—so if you want to follow anything up that I quoted, you can. What I must commend to you, however is the book written by Tristram Stuart called Waste: Uncovering the global food scandal. It was published in 2009 and is the go-to book for this topic (see the reference list). I hope the following is food for thought (all puns intended)! There are numerous ways to describe food—fast, slow and comfort quickly spring to mind. Much of our world can be defined by food—from the distinctive flavours of regional cuisines, to the one-size-fits-all-tastebud offerings of many a fast-food chain. But why or how could food—that which is essential for sustaining life—be inglorious? That food is so unevenly distributed around the globe is in itself scandalous—that almost half of the food produced by, and for the Global North is wasted, is shocking, disgraceful, and definitely inglorious. How did we become so wasteful, what are the impacts and what can be done about it? Periods of feast and famine have been well documented since biblical times, so having an excess is nothing new, but profligacy of food is definitely a phenomenon rooted in 20th-century Western culture. If you examine the childhood of your parents or grandparents you will probably uncover stories about food that are both quaint and bizarre. In the 1950s, in rural and regional Australian towns, it was commonplace for dairy products to be delivered in glass bottles to the doorstep, to shop at a greengrocer (for fruit and vegetables), a butcher shop (with real sawdust on the floor) and a general store, where bulk flours and grains were measured into brown paper bags, and cheese cut from a wheel, weighed and wrapped in grease-proof paper. Children were encouraged to clean their plates at meal times, often prompted to be thankful and eat every morsel, as there were “starving children in Biafra”. But during this post-war era, food production went into overdrive, with the excesses processed (canned, frozen and dried) and heavily marketed, giving rise to the industrialisation of food (Bittman 2007). 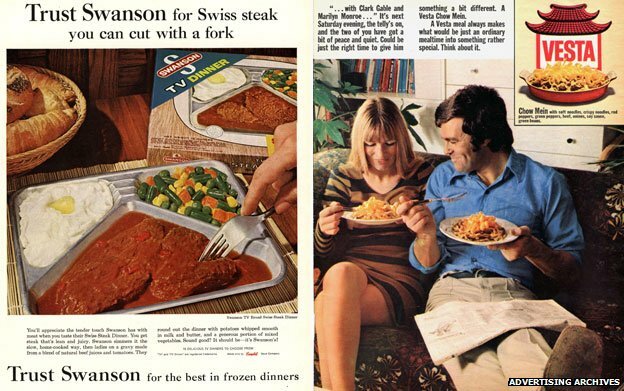 During the mid 20th-century, all sorts of faddish foods emerged, including TV dinners and Vesta Ready Meals. In Australia, supermarket shopping became the norm in the 1970s, where a rich array of all sorts of commodities could be found. Today, these same supermarkets are packed full, with an even larger variety of foods—many imported. One could debate the reasons behind the creation of such excess, from the psychology of ‘having enough’ (Naish 2009) to the neo-Capitalist drive for greater profits*, but the implications across the sustainability spectrum of producing and allowing a large proportion of this food to go to waste, are significant. Just producing food for a Global North diet has many negative environmental impacts, including loss of biodiversity (as forests and natural habitats are stripped for cropping and ranching), land degradation, air and water pollution and consumption of precious water resources (Bittman 2007). In many Global South countries, demand for native foods for foreign palates—as food fads come and go—is making staples for locals unaffordable (Blythman 2013). Food processing, packaging and transportation further add to economic, social and environmental impacts. Even greater impacts come when this food is wasted and ends up as anaerobically decomposing matter in landfill—resulting in the release of methane gas into the atmosphere. Australian households throw out more than $5 billion worth of food each year, with over 40 per cent of household food wasted (Thompson et al 2010 ). According to OzHarvest, an Australian not-for-profit food rescue service, 3.28 million tonnes of food is driven to landfill in Australia each year, and an estimated 20–40 per cent of fruit and vegetables are rejected before they even reach the shops—mostly because they don’t conform to strict supermarket cosmetic standards (OzHarvest 2014). Globally it appears that the situation may only get worse, as large sections of the Chinese population move to adopt Global North eating habits. 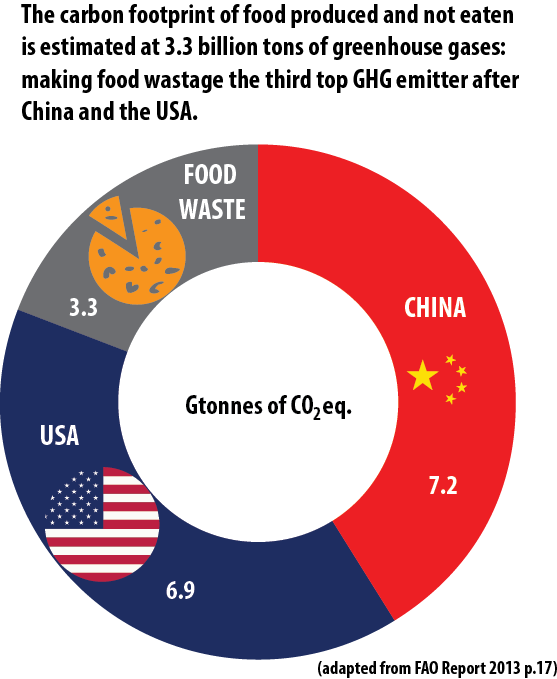 According to Xin et al (2014), current food waste in China comprises 70 per cent of the country’s total garbage, which looms as a major problem, as the country currently lacks a national policy, scientific management or processing methods for sorting and disposal. But it’s not all bad news, and to coin another proverb “Where there is a will, there is a way”! Many good things are being done to address food waste at international, national and local levels. UNEP, FAO and Messe Düsseldorf launched the international campaign Think Eat Save—Reduce Your Footprint in 2013, which seeks to galvanize widespread global, regional and national actions against food waste (see http://www.thinkeatsave.org). Their website is a treasure trove of inspiring stories and practical examples of how to make a difference. On a national level, in many countries, it has been identified that a lot of good, edible food is unnecessarily sent into landfill from supermarkets, restaurants and corporate functions—food that could be fed to the food insecure. In America, collection and distribution agencies are covered against potential litigation, in many States, under the Good Samaritan Act (Stuart 2009), while in Australia, food rescue organisations such as Food Bank and OzHarvest, are covered under various state legislations (see http://www.ozharvest.org/donatefood.asp?pageID=618). Intriguingly no similar legislation exists in the UK (Stuart 2009) making food recovery problematic. Processing and treatment of food waste disposal is gaining strength—from the exemplary large scale bio-digesting operations at NFL matches in the USA (Casey 2013), to worm farms at airports (Lammers 2011) to trials of local government-run home-composting systems by the Leichhardt Council in Sydney’s inner west (Mitchell 2014). In the National Food Waste Data Assessment: Final Report (Masson 2011) indications are that there may be great value in harnessing food waste not only for energy generation, but also for soil enhancement as conventional fuels and fertilisers become more expensive. Other campaigns include Love Food Hate Waste (http://www.lovefoodhatewaste.nsw.gov.au), the Glad Company Waste in Focus website (http://www.glad.com/trash/waste-in-focus/)and the recent push by EU countries to examine and revise the confusing food labelling systems that see a lot of food being binned needlessly at the supermarket and at home (Kaye 2014). But what can be done on a personal scale? Most of us don’t have the time or the space for a worm farm, let alone a flock of chickens or a hungry pig to take care of the peelings and scrapings from our plates! According to the Foodwise site, small changes in individual behaviour can have significant impacts from the home front. These include cooking less food, eating what is cooked (ie using all the leftovers), buying what is needed (check the fridge and shelves before you shop, and never shopping when you are hungry), understanding the nuances of the food date-labelling systems, and resisting the temptation to buy take-away instead of cooking the food you have at home (Do Something 2014). As individuals, as consumers, making informed choices and starting a conversation about over-production and wanton waste is a good place to start! Bittman, M. 2007, What’s wrong with what we eat, TED Talk. http://www.ted.com/talks/mark_bittman_on_what_s_wrong_with_what_we_eat Viewed 3 June 2014. Blythman, J. 2013, Can vegans stomach the unpalatable truth about quinoa? The Guardian, 16 January 2013. http://www.theguardian.com/commentisfree/2013/jan/16/vegans-stomach-unpalatable-truth-quinoa Viewed 4 June 2014. Casey, T. 2013, Cleveland Browns roll out new food waste-to-energy system, Triple Pundit: People, Planet, Profit, 18 November 2013. http://www.triplepundit.com/2013/11/cleveland-browns-rolls-out-food-waste-energy-system/Viewed 29 May 2014. Do Something, Foodwise: Your site for sustainable food http://www.foodwise.com.au Viewed 29 May 2014. FAO, 2011. Global food losses and food waste—Extent, causes and prevention, Rome. Fresco, L. 2009, We need to feed the whole world, TED Talk. https://www.ted.com/talks/louise_fresco_on_feeding_the_whole_world Viewed 5 June 2014. Glad 2014, Waste and recycling at home, http://www.glad.com/trash/waste-in-focus/ Viewed 3 June 2014. Kaye, L. 2014, To combat food waste, EU seeks change of ‘best before’ dates, Triple Pundit: People, Planet, Profit, 19 May 2014. http://www.triplepundit.com/2014/05/european-union-seeks-change-best-dates-combat-food-waste/ Viewed 29 May 2014. Lammers, L. 2011, Charlotte to install first airport worm composting system, Triple Pundit: People, Planet, Profit, 29 November 2011. http://www.triplepundit.com/2011/11/charlotte-install-first-airport-worm-composting-system/ Viewed 29 May 2014. Mason, L. Boyle, T. Fyfe, J. Smith, T. & Cordell, D. 2011, National Food Waste Data Assessment: Final Report. Prepared for the Department of Sustainability, Environment, Water, Population and Communities, by the Institute for Sustainable Futures, University of Technology, Sydney. Mitchell, N. 2014, Food Waste, Radio National Life Matters, 9 April 2014. http://www.abc.net.au/radionational/programs/lifematters/food-waste/5375576 Accessed 19 May 2014. Naish, J. 2009, Optimisation (Chapter 3) in Stibbe, A. (Ed.) The handbook of sustainability literacy: Skills for a changing world, Green Books, Dartington. http://www.sustainability-literacy.org/ Accessed 2 June 2014. New South Wales EPA, 2014, Love Food Hate Waste, http://www.lovefoodhatewaste.nsw.gov.au Viewed 5 June 2014. OzHarvest, 2014, Food waste figures, http://www.ozharvest.org/ourimpact.asp?pageID=611 Viewed 5 June 2014. Strasser, S. 1999, Waste and Want, Metropolitan Books, New York. Stuart, T. 2009, Waste: Uncovering the global food scandal, Penguin Group, London. Titleman, G.Y. 1996, Random House Dictionary of popular proverbs and sayings, Random House, New York. Thompson, K. Dawson, D. Boland, J. Coveney, J. Ward, P. & Sharp, A. 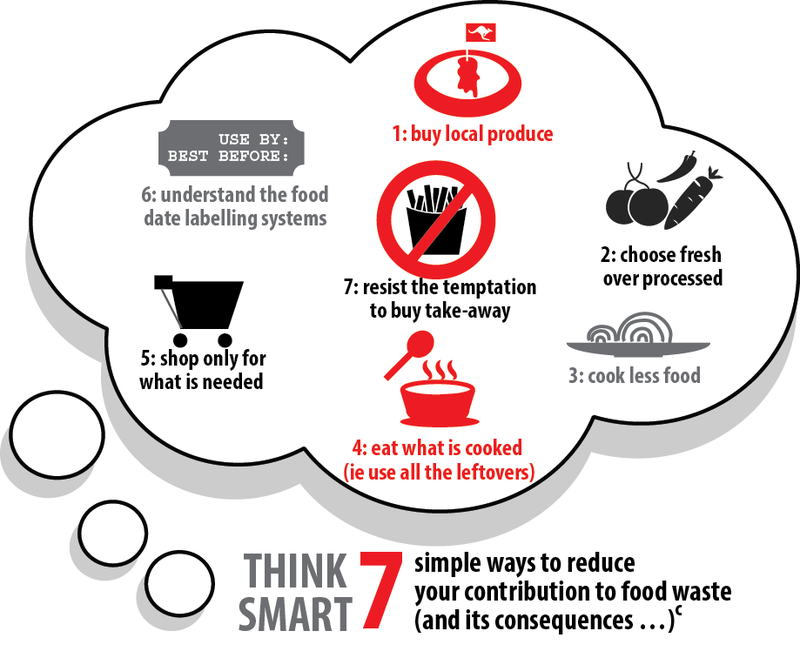 2010, Zeroing in on Food Waste: Measuring, understanding and reducing food waste, ARC Food Waste Project, Australian Research Council (ARC) Linkage Project 2010–2013. http://www.cqu.edu.au/research/research-organisations/institutes/appleton-institute/research/current-projects/arc-food-waste-project Viewed 5 June 2014. Xin, Z. Kaihao, W. & Anqiet, C. 2014, Waste not, want not, China Daily Mail, 5 June 2014. http://usa.chinadaily.com.cn/epaper/2012-01/19/content_14477508.htm Viewed 5 June 2014.